You’re here! 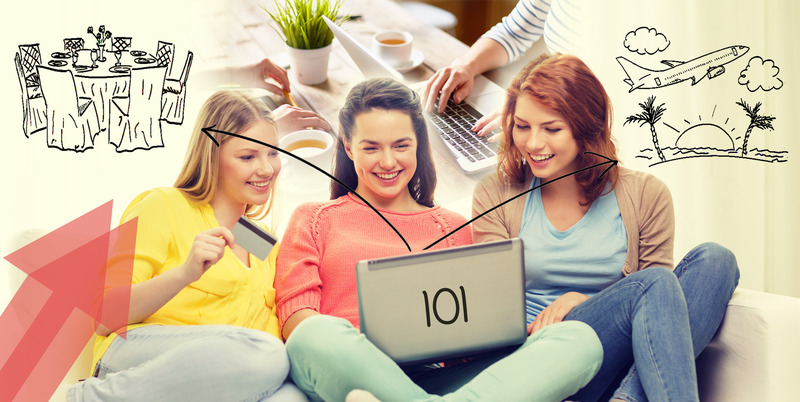 Welcome to our ultimate hen party planning 101 guide. Although long, this article is the one place where you can find every tip, every section of planning and every unthought of aspect you need to create the perfect hen do for any bride to be. 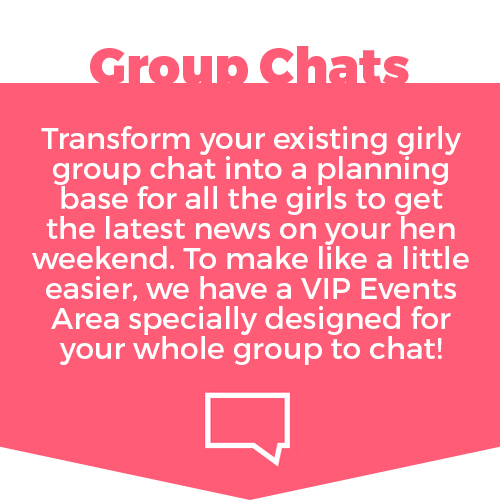 Being a hen do planner, we’ve curated this advice over years of planning hen parties and offering epic hen party activities, and put all of them into practice to make sure it works for every situation! So, grab a few friends, some snacks and maybe a cheeky bottle of wine (or two?) and get settled in to this hen party planner book extravaganza. The first port of call for any party or event is the date. This solidifies the plans in stone, and can give you a good idea of who can come and how long you have to finalise all the juicy details. Once you have a date, the world is your oyster – but we suggest you hop to it pretty quickly, there’s lots to do! Leave enough time in between the hen do and wedding so that your guests can be financially comfortable to cover both of the events. Consider other people’s plans, make sure the last night of freedom doesn't conflict with any other big plans. Think about bank holidays, time off work and any other obstacle that might arise when trying to get a big group of girls together. The guest list might seem like it’s an easy, breezy part of planning, but it can all get on top of you if you’re not careful. No matter how many fabulous hen party packages or getaways you organise, the whole thing wouldn't be the same if it wasn't celebrated with the bride’s nearest and dearest. CHECK WITH THE BRIDE! This is obviously the most important thing to do before you even start organising anything. Does she want her mother there? Is it just friends? What about her fiancés' sister? All of this is your budding bride’s call – so consult with her on this one. Make Yourself a List, and don’t try to remember all the names your bride spouts. Either create a written list or, if you’re really fancy, make yourself a big old excel document with all the details. This is a bit more of an overwhelming step for you bridesmaids, mainly because there are so many places to choose from when it comes to planning a hen party. If you’ve really got no clue, we suggest starting with Home vs Away. With both home and away, there are perks and drawbacks that you need to consider in order to craft the perfect hen do for your particular pal. The biggest and best perk is the amount of money you’ll save if you stay on our little wet island. Not paying for flights, accommodation and euros means more money for spectacular hen party activities, accessories and personal touches. It might also mean that more people can afford to come, which can play a big factor if some of your bride’s nearest and dearest are working on a tight budget. A drawback (for most gals at least) is that it doesn't really feel as special to stay at home. Sometimes, you don’t need all the crazy activitiesto make a splash with the last night of freedom. A whole lot of sun and some delicious cocktails on the beach is sometimes just enough to make the bride to be feel special. At first glance, planning a hen do away can seem like a daunting task for just a few bridesmaids to conquer. We’re here to tell you that there’s loads of ways it can be easier, and equally loads of ways slightly more organising can be worth the pay off. A hen party away usually means a whole weekend of celebrations, and a few days taken away from the wedding stresses, surrounding the bride to be with people she loves. Aside from all the sappy and gooey stuff, planning flights for 20 girls is A LOT to handle. You and the other bridesmaids need to be prepared to be strict with budgets, and make sure everyone is aware of how much a whole weekend of sun and lounging will cost. Once you’re over this hurdle, the rest of planning a hen party away can be a totally fun experience. We at Funktion Events care about your protection when you are travelling away. Which is why we are a Member of ABTA. Make sure you are always travelling with confidence, over the past 65 years ABTA have been offering advice and guidance to a very high standard for agents and the public within the travel industry. Once you’ve got the basic three W’s out of the way, it’s time to really get started on the ins and outs of this intricate occasion. Before you dive into hen party locations, activities, and more, here’s a few general tips you should consider throughout the WHOLE hen party planning process. Give Plenty of Notice. Basically as soon as your friend gives you the wonderful news (and probably since you’ve met, let’s be honest), you should be running through all the plans in your head. From there, make sure you let all the girls, family members, dogs, cats and everyone else know the situation. Be Strict. Don’t allow room for confusion with anyone, sometimes you need to be cruel to be kind in the long run. 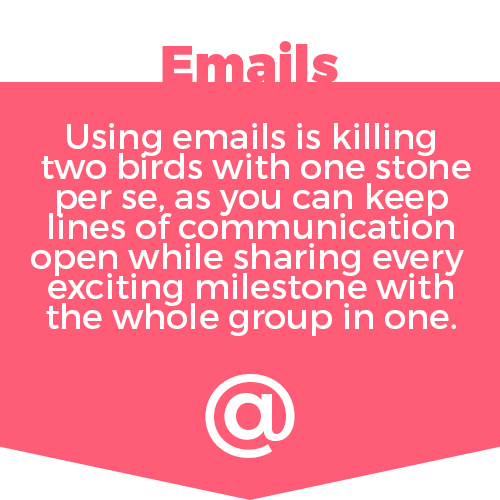 Make sure everyone knows what they’re paying, times, all their respon­sibi­lities and everything in between. Consult the Bride. Even if the bulk of what you’re organising is a surprise, you can still check back with the bride on certain, maybe more important things like locations, budgets and guest lists. Consider Your Audience. When your hen has put together her perfect guest list, you need to consider this when you’re organising crazy hen party activities or tiring days out. Ask yourself – will the bride to be’s future mother in law thank you for dragging her go karting for the day? Be Organised. Channel your Monica Geller, ladies! 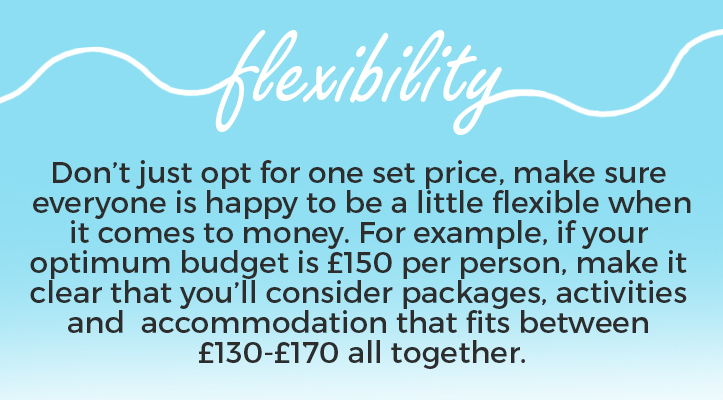 Sometimes tricky, sometimes a sticky situation, but when it boils down to it, setting a budget is really important aspect of hen party planning. 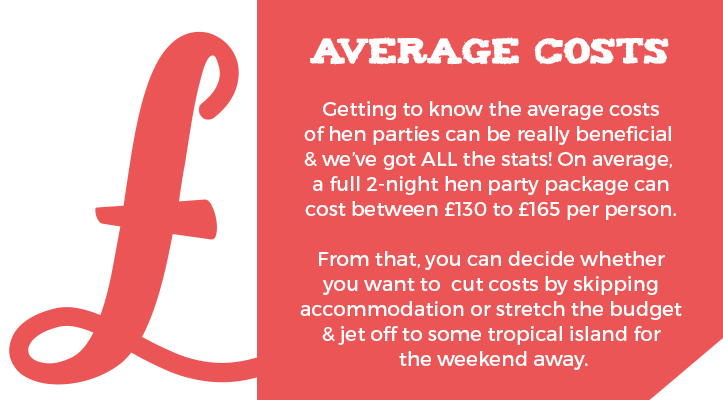 When planning a hen party, we say the best way to go about setting and keeping a budget is to be completely transparent with money. Tell the girls the costs straight away, and make cuts and changes where necessary to make sure you can balance the fun factor with practicality for everyone. With a bit of the nitty gritty stuff out of the way, it’s time to get on to more exciting topics – although we think the whole hen party planning process is pretty exciting, right? Building excitement is usually pretty easy when it comes to a group of giggling girls looking forward to a weekend of celebrations, but here’s a few other things you can do to make sure everyone is pumped and ready to give your budding bride the night of her life. Two Hen Party Activities for £54! Any situation, every mistake, all the scenarios that could arise…basically be prepared for anything and everything that could make your hen party planning and the hen do itself less than perfect. We’ve got a few little ways you can help make sure things run smoothly when planning a hen do (you can thank us later for these bad boys). Backup Kitty. Just like a drinks kitty for the bride to be, ask all the bridesmaids to pitch in a few quid to a backup kitty. This can cover any lost cash, extra costs that you might not have planned for or even outfits getting ruined. Trust us, a bit of extra cash never goes amiss on a last night of freedom. Dress Code. It’s every girl’s nightmare to scour the shops, spend hours on the internet and find that very perfect outfit for a big event and then…someone else is wearing the same thing. We’ve all been there ladies, and this is just one of the MANY reasons why you need to set a dress code. Whether it’s a funny theme, a reference to your bride to be’s favourite film or just a simple little black dress attire, make sure you lock down a dress code so all the girls are happy. Games! In between all your pre-planned hen party activities and boozy nights, a few games are sure to go down a treat and keep the party spirits alive. If you’ve not sorted these yet, you’re in luck! 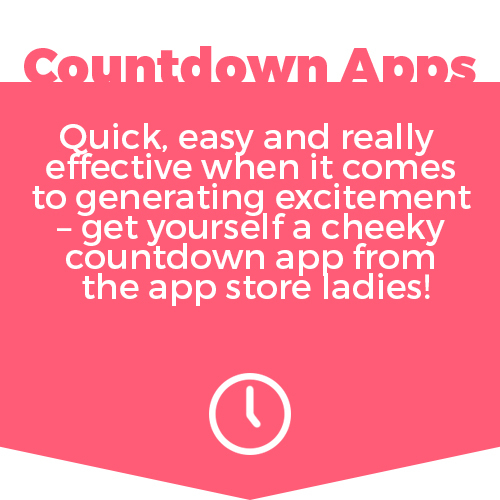 Have a cheeky peek at our hen party gamesand download the list for free, take it with you for the weekend and enjoy a few silly games while you celebrate your budding bride. When all the official stuff is sorted, the money has been dealt with and the dates are set, make sure you finalise the hen do with a few personal touches as an ode to your soon-to-be wed friend. We couldn't create a hen do planner book without them of course. These can be small, but making sure a last night (or weekend) or freedom is personal and thoughtful will all go towards making the event memorable. Photographs of your bride. Make masks with your brides’ face, create a game with her baby pictures or get them printed onto a cringy t-shirt. Whatever the case, this is a funny and cute way to incorporate her into the occasion. Personalised t-shirts. If it’s not a photograph you want, why not get some hilarious text or funny nicknames printed onto matching t-shirts for the whole party to wear (it will deffo keep anyone from getting lost!). We’ll even pass you some ideas in our free t-shirt names and phrases list. Mr & Mrs Quiz. Nothing is more personal than the budding bride answering questions about her soon to be hubby in front of a bunch of giggling girls. Before you go, grab a Mr & Mrs Quiz and fill it out specific to your pal.